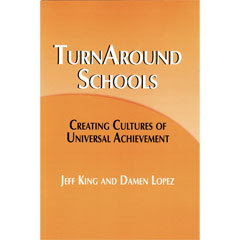 I just finished reading TurnAround Schools today! Excellent book by Damon Lopez and Jeff King. Damon was featured in "Whatever It Takes" by the 3 R's and I had the chance to meet him at a SPARK conference in Milwaukee back in May. Great guy with a great message...All kids can succeed no matter their personal life circumstances. Poor, single parent, homeless, only meals at school, none of these are excuses for Damon or his staff. Jeff King and he have created simple rules to establish what separates average collaboration, average data assessment and average interventions from exceptional practices that make these strategies more successful for all students. Highly recommended and it is an easy and short read.